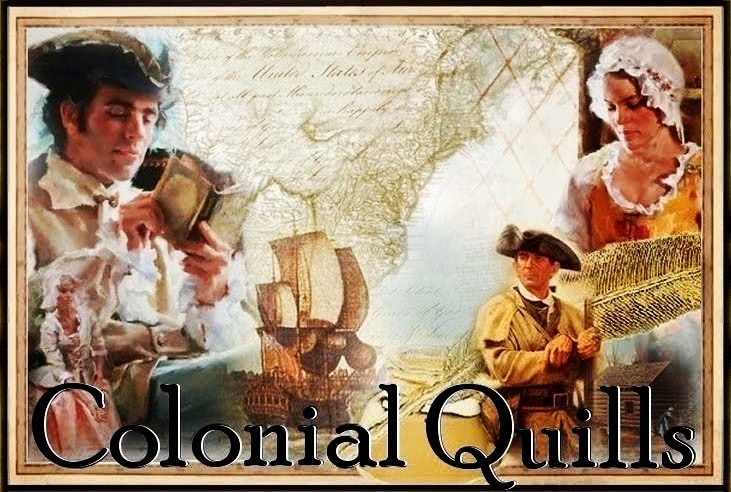 In 1706, the South Carolina Commons House of Assembly voted to establish the Church of England as their official church and divided the colony into ten parishes. 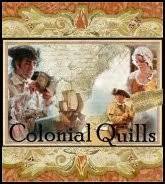 Each parish had one central church with smaller affiliated churches, designated as chapels of ease. These outlying meeting places provided local church attendance to the more remote areas of the parish. 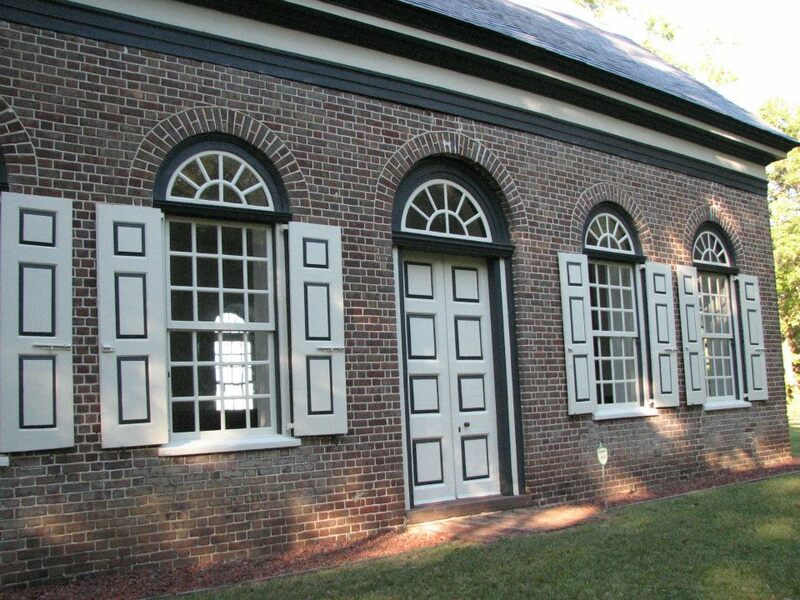 I've written previously about Strawberry Chapel, a chapel of ease for St. John's Parish in Berkeley County, and St. George Anglican Church at Colonial Dorchester, but I've had the pleasure of visiting others during my years of living and touring around the South Carolina lowcountry. 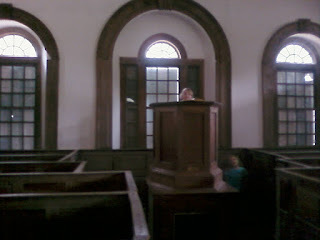 There's a very small person in that pulpit--and beside! 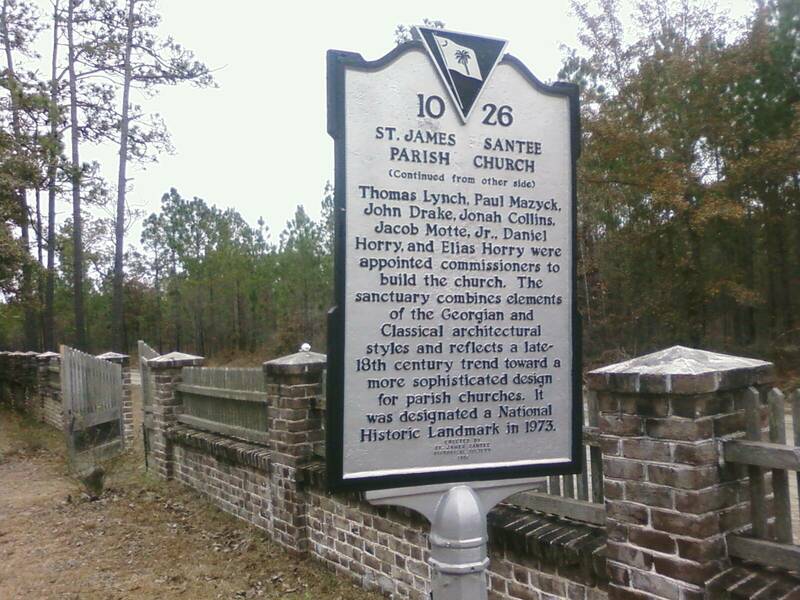 Our visit to St. James Santee Church was almost accidental, a side trip on the day we'd driven up to McClellanville to see Hampton Plantation. The elegant brick chapel is located way down a sandy road which traces the route of the old King's Highway between Charleston and Georgetown. The building is noteworthy as an example of Georgian architecture, completed in 1768, and a list of all its features is found at South Carolina's National Register site: http://www.nationalregister.sc.gov/charleston/S10817710012/index.htm. Our family found it interesting for the original enclosed box pews and the raised pulpit. Its history is noteworthy as a place where English settlers worshiped together with French Huguenots: http://homepages.rootsweb.ancestry.com/~scroots/sc13846.htm and http://www.stjamesec.org/brickchurch.html. 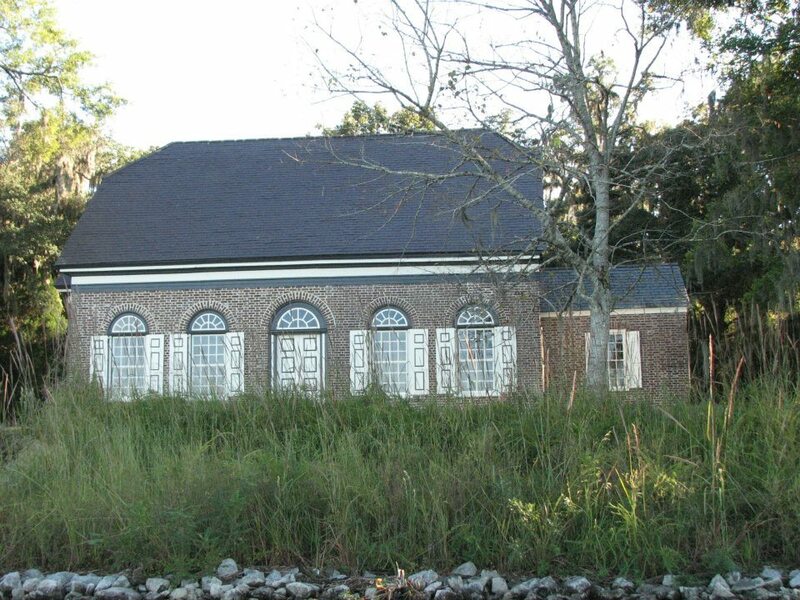 Very similar in archectural style is Pompion Hill Chapel, a chapel of ease for St. Thomas's parish, built 1763-65 on the banks of the Cooper River in rural Berkeley County. (On the east branch of the Cooper, incidentally--across the river and some from Strawberry, which is on the west branch.) Reportedly Pompion is the French word for "pumpkin," and so the name permuted to "punkin" and in one contemporary spelling is cited as "Ponkin Hill." We visited here during a family boat trip up the east branch of the Cooper River. 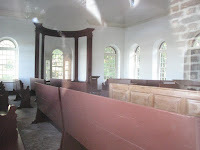 When we stopped at the churchyard for exploration, the church was locked, but we took a peek through the windows. 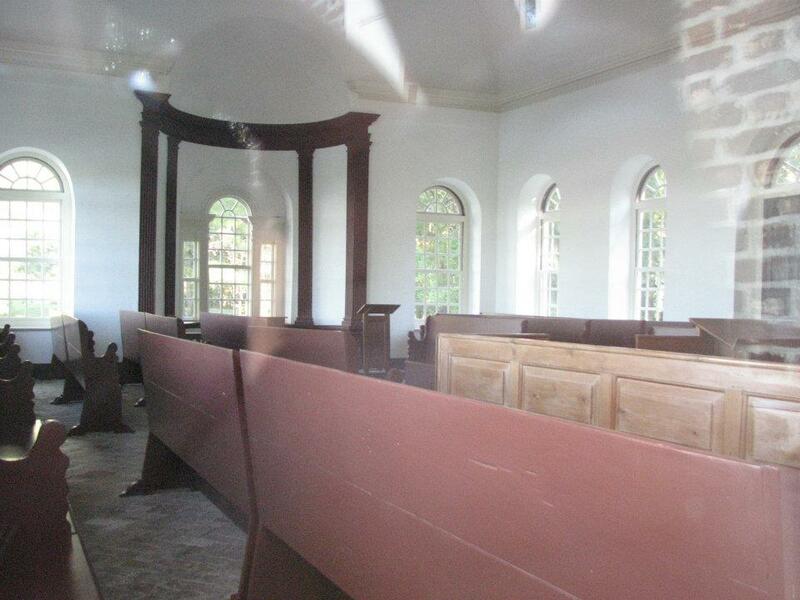 A raised pulpit is located far right of the window where this shot was taken, but it appears that most of the original box pews are gone. 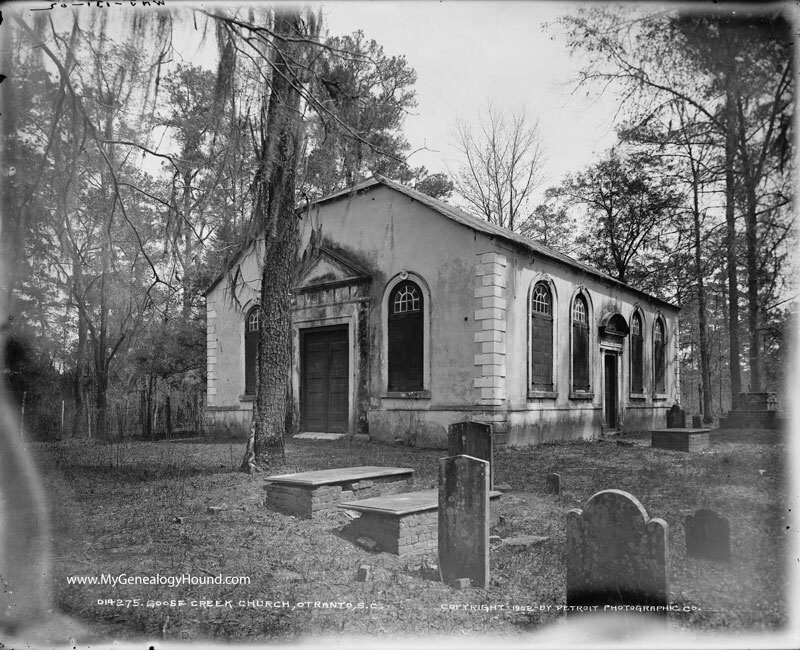 The historic church closest to where we lived was one I sadly never took the opportunity to go see: St. James Goose Creek, chapel of ease for St. James's Parish. This one, built 1713-19, has quite a history. 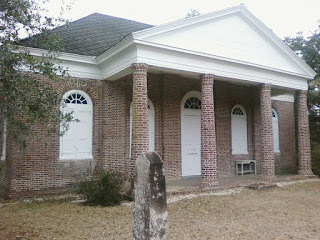 Legend has it the church was spared during the British occupation of Charleston, during the American Revolution, because of the royal seal displayed behind the pulpit. Just from its photos, the church building reminds me of Strawberry Chapel with its white stucco exterior. I find it interesting that all four historic church buildings (including Strawberry) share the Georgian building style and jerkinhead roof type. 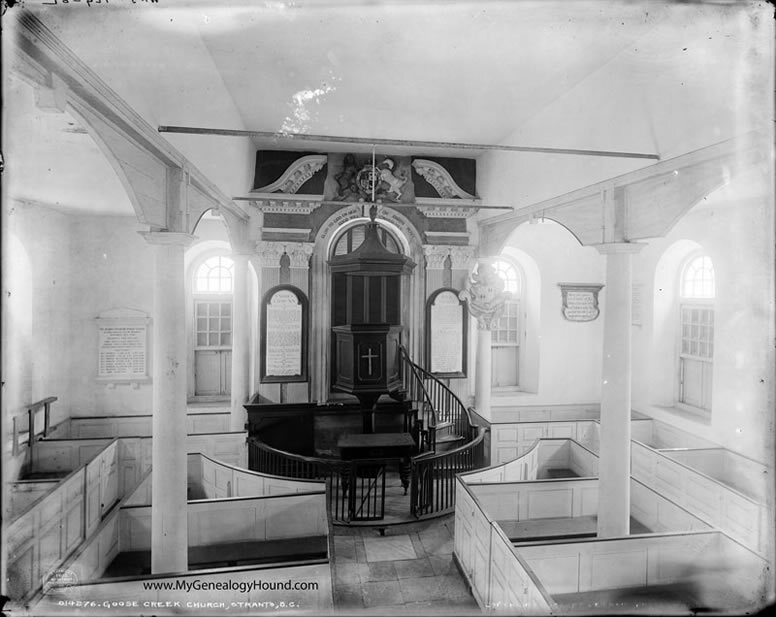 Some sustained more damage than others over the years (the Goose Creek church suffered a partial collapse in the 1886 Charleston earthquake) but all have been restored and/or kept up as examples of colonial-era architecture. I would love to visit these one day. Thanks for sharing and the photos. You're quite welcome, Tina! Thank *you for stopping by! So different than the churches I'm used to up north. No steeples! I wonder if the steeples were a nineteenth century addition? But yes, the style is very distinct! I think old churches are just so cool to see and visit.